The most appropriate route of administration is considered to be oral, because of the patient compliance and of economical issues. Drug delivery nanosystems are defined as technological platforms that promote the effective administration of bioactive molecules or therapeutic agents (protein, peptide, antibody, genetic material) in the human organism. Drug delivery nanosystems have been evaluated based on their physicochemical and structural properties and on the way that they behave within biological media. They are developed to optimize the production of new medicines, to ameliorate patient compliance, and to improve their targetability from systemic to specific tissues and cells. Hybrid and chimeric drug delivery nanosystems are two major classes that are categorized based on the nature of the mixing biomaterials to produce the final nanocarrier. Their ability to mimic the functions of natural objects proceeds to the category of bio-inspired drug delivery systems. Calorimetry is a technique that can be used to measure the heat capacity of a material with a well-defined mass. It is also used to determine thermal effects that occur in physical, chemical, and biological processes. It is of interest that changes of enthalpies in mixed materials such as biological objects or biomaterial-formed nanoparticles are issued to the field of calorimetry. Thermodynamics is considered as a basic element in physics, and thermal analysis is used to determine the thermal effects of materials and biomaterials, and it is considered as one of the most popular techniques in material sciences and engineering . There are a numerous thermoanalytical techniques (see Chap. 2) which can provide information such as polymorphism, stability, interactions, and physical purity of biomaterials or of self-assembled nanostructures such as liposomes, micelles, and nanoparticles (Gardikis et al. ). There are several applications that can be considered as very helpful in order to establish the behavior of biomaterials and of nanostructures. We can point out that processes such as melting, polymorphism, purity vaporization, glass transition, compatibility between different biomaterials in nature, etc. are highly related to the field of thermodynamics. Supramolecular structures at nanoscale level are very promising and can be used in drug delivery in imaging and in diagnosis. The biophysics and thermodynamics are considered as scientific building blocks for evaluating drug delivery systems . Biophysics is a valuable element in order to explain the orientation and reorientation process of a nanosystem taking into account the external environmental parameters, and it is also used to understand the organization of nanostructures comparing their behavior with that of living organisms. It is well established that different phases such as cubic, hexagonal, inverse hexagonal, etc. can be produced depending on the physical micro- and macro-environment parameters such as temperature, ionic strength, pH, osmolarity, and concentration of lipids to be used for producing liposomal bilayers. The aforementioned changes can be directly correlated with physicochemical and biophysical behavior of liposomes as drug delivery systems, such as kinetics in drug release, stability, surface functionality, etc. The melting process of lipidic drug delivery nanosystems, i.e., liposomes, affects the behavior of lipidic membranes and induces events leading to transitions and creation of metastable phases (see Chap. 2). Thermodynamics is considered as a basic element in physics, and thermal analysis is used to determine the thermal effects of materials and biomaterials, and it is considered as one of the most popular techniques in material sciences and engineering. There are a numerous thermoanalytical techniques (see Chap. 2) which can provide information such as polymorphism, stability, interactions, and physical purity of biomaterials or of self-assembled nanostructures. The naturally occurring infrastructures are composed of different nature biomaterials such as hydrocarbons, proteins, lipids, etc., and this could be an efficient model that can promote artificial structures and strategies in order to develop innovative drug delivery nanosystems. By combining different nature biomaterials such as lipid and polymers, chimeric artificial supramolecular structures can be built up (see Chap. 5) . Their thermodynamic profile contributes to the development process and to study their equilibrium states by passing from one metastable phase to another. The steady state is almost eliminated and their organization profile promotes their functionality and can be related with their stability. A Gibbs free energy difference, Δ (ΔG), is an appropriate thermodynamic parameter to initiate the equilibrium state in innovative mixed in nature bilayer between different membrane segments of different curvatures. This attributes to a high involvement of thermodynamics in studying and measuring the transitions between lipidic phases. The formation of lipidic vesicles has been extensively studied by researchers mainly in the field of colloidal science, and the polymorphism of phospholipids seems to play a key role because of its relation with the geometrical characteristics of liposomal vesicles. The geometrical aspects and the thermodynamics and their compromise relationship are under investigation especially with those vesicles that are categorized as chimeric drug delivery nanosystems ( Chap. 5). The metastable phases are considered as important element in order to realize the thermal behavior of lipidic bilayers. The lipid-water systems can create lipidic phases with predominant lamellar phases, depending on the lipid concentration. Liposomes belong to drug delivery nanosystems and are characterized as lyotropic liquid crystals (see Chap. 4). The conformational polymorphism of their lipidic bilayers is responsible for the mesophases, i.e., metastable phases, taking place in phase transitions and is related to their thermal stress during phase transitions. Their thermal stress takes place during liposome dispersion system storage or during administration in humans. The thermodynamic parameters that affect and participate in physical stability and, therefore, in pharmaceutical effectiveness of the liposomal product are as follows: Tm, temperature of basic transition from liquid crystalline phase to isotropic fluid; ΔT1/2, the phase transition range in the middle of the peak (this temperature range is related to the cooperativity of system phospholipids or phospholipids and enclosed bioactive molecule); ΔΗ, system enthalpy change; and ΔCp, system thermal capacity change under constant pressure. The identification and study of these mesophases of liposomal nanosystem lipid bilayers allow the control over the thermodynamic parameters mentioned above, in order to rationally design the liposomal system with the most satisfactory physical and thermal stability . Thermal techniques are considered as valuable to study the thermal behavior of the conformational polymorphism (i.e., metastable phases) of drug delivery nanosystems, such as liposomes, while they are used to evaluate the physicochemical properties of drugs and their interactions in in vitro biological media, as well as their behavior during the formulation process . 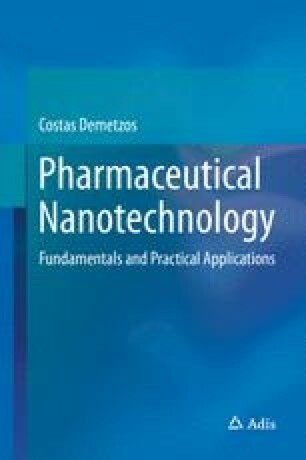 The regulatory issues concerning the design and the development of innovative drug delivery nanosystems involve a combination of valuable techniques for structural and thermodynamic characterization in order to completely delineate the physicochemical/thermodynamic balance . From the regulatory point of view, thermal analysis can provide rational approaches to fully characterize delivery nanosystems that could be applied in pharmaceutics, adopting the thermodynamics in the evaluation of the development process of medicines. Innovative drug delivery nanosystems are classified as hybrid and as chimeric in order to facilitate their studies based on biophysical and thermodynamic aspects. The above terms are the evolution of the Liposomal Lock in Dendrimers (LLDs). The metastable phases of hybrid and chimeric nanoparticulate systems determine their stability, release of the incorporated bioactive molecule, and functionality and can translate the cooperativity of their building elements and their biophysical behavior based on the origin of the biomaterials that they are composed of. The innovation profile of bio-inspired drug delivery nanosystems is based on their ability to mimic the function of natural objects. Moreover, their fabrication process could adapt various aspects that nature use to build up high-performance biological units. Bouchard H, Viskov C, Garcia-Echeverria C (2014) Antibody-drug conjugates—a new wave of cancer drugs. Bioorg Med Chem Lett 24(23):5357–5363. doi: 10.1016/j.bmcl.2014.10.021.